Please join us for our FREE April program night with Julie O’Donald, Community Wildlife Habitat Steward and Master Gardener, as we delve into the fascinating world of creating garden habitat. Julie will give an overview of the elements that create beautiful gardens for birds and people, emphasizing best native plants for birds and design features that create and sustain bird habitat. Beautiful photography of birds and their food plants will show how to bring nature home to any size property. 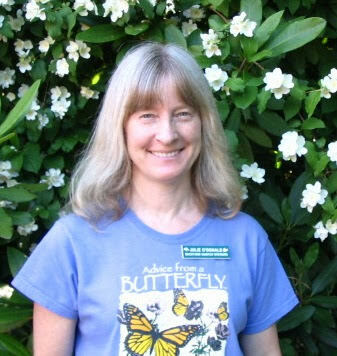 Julie is the team leader for the Brier Wildlife Habitat Project and actively involved in community education and outreach for Pilchuck Audubon Society, Kruckeberg Botanic Garden and the Washington Native Plant Society. In addition, Julie's personal certified wildlife habitat garden contains over 200 species of native plants and has been successfully attracting birds, butterflies and pollinators for more than 25 years. It has been featured in Pacific Horticulture, The Butterfly Gardener, Bird Watching Magazine and Sunset publications.